IRISH WATER HAS urged people to be more mindful of flushing inappropriate things down the toilet after an 8ft sewage blockage was cleared in Co Wicklow. The blockage occurred as a result of items such as wet wipes, cotton bud sticks, nappies and cotton wool pads being flushed down the toilet instead of being put in the bin. It was the third blockage, also known as ragging, removed from the Bollarney Wastewater Pumping Station by Wicklow County Council staff in one day last weekend. Last year, Irish Water cleared more than 6,000 sewer blockages around the country which were caused by inappropriate items being flushed down the toilet. The utility said thousands of unsuitable items are flushed down the toilet every day. Annabel Fitzgerald of Irish Water said this has a “significant negative impact” on internal plumbing in homes and businesses, the wastewater network and the marine environment. “The size and scale of the impact of flushing the wrong items down the toilet is incredible,” she said. Wastewater infrastructure is being upgraded throughout Ireland, with new treatment plants being built and old plants upgraded as well as the laying of new sewers. “It is still really important that people recognise the impact of what they flush so the network can function efficiently and effectively,” Fitzgerald said. Irish Water is working in partnership with Clean Coasts to deliver the Think Before You Flush campaign, which reminds people of which items are, and are not, suitable to flush down the toilet. 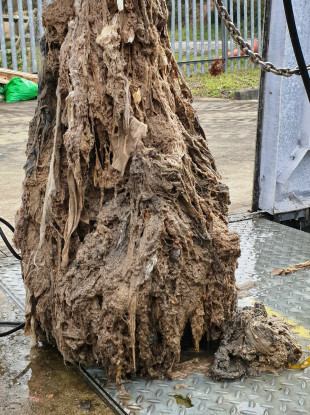 Email “8ft fatberg made of wet wipes and nappies removed from sewer in Wicklow ”. Feedback on “8ft fatberg made of wet wipes and nappies removed from sewer in Wicklow ”.